Adapted from a paper published in Taoci, the annual review of the Oriental Ceramic Society of France(2). 'Paulo Tymon' by Wenceslas Hollar (1607-77), reproduced in Nieuhoff 1699, p.29. 'Pulau' is modern Malay for 'island'. Tioman is a relatively large mountainous island, about 24 miles from the east coast of peninsular Malaysia, with three of its peaks rising to about 1,000 metres (some 3,000 feet) and visible far out in the South China Sea. Much of its 44 square miles is covered with tropical rain forest. A narrow coastal strip is partly cultivated, and on it are found small villages and settlements, with a local resident population of about 1,000, and now increasingly a temporary population of tourists. A varied coastline has rocky inlets, some sandy bays and the occasional harbour affording shelter whatever the season. The island has abundant water throughout the year. In 1985 an exhibition of trade ceramics found on the island and dating from the 11th to the 19th century was held at the Muzium Seni Asia, the University of Malaysia Art Museum(3). The exhibition was based on some 1,600 ceramic finds, both sherds and complete pots, principally from China, but also from Thailand, Vietnam and Europe, together with some locally-made earthenwares. Over 800 of the ceramic sherds were made at kilns in Guangdong in southern China, date from the 11th to 12th century, and were found at Nipah on the western side of the island(4). Where possible the sherds were matched to similar wares in the University Art Museum (many of which were originally discovered in Indonesia), to other trading sites, and to dated archaeological material from known kiln sites in China. On the western side of the island at Nipah, ceramic sherds were found in the bay and in shallow water along the seashore, excavated near the lagoon, and discovered in a cave in the hills nearby(5). Each year after the storms of the monsoon season the line of the sandy seashore changes and more sherds are washed up. There was another site, on the eastern side of the island at Juara, where ceramics were found in the 1970s when an area for a football ground was excavated; these are now in the Sultan Abu Bakar Museum in Pekan. A short while before the exhibition opened, an archaeological team from the National Museum in Kuala Lumpur carried out excavations at both Nipah and Juara. Imported ceramics and local earthenware pottery were excavated down to the lowest levels, together with coins, stone, metal, beads and glass, and although not in the exhibition they corresponded to the earlier finds and are all fragmentary evidence of trade. Many of the ceramics found on Tioman can he matched to ceramics recovered from shipwrecks found in Southeast Asia and as far away as Korea, Sri Lanka and the coasts of Africa and America, because Tioman was for centuries involved in the maritime trade of Asia, which was extensive(6). Ewer with pale cream qingbai glaze, from Chaozhou kilns in Guangdong, C11-12th. Large Guangdong stoneware jar with 4 horizontal handles and stamped stylised flowers, C11-12th. Arab, Chinese and later European references to trading in the area are all corroborated by archaeological finds on the island. 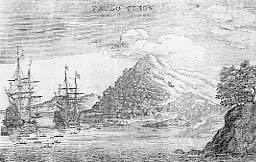 Tioman was on the western trading route from China: ships went via Vietnam and Thailand, around peninsular Malaysia, either through the straits of Malacca, or on to Sumatra, Java and the straits of Sunda to the Indian Ocean. John Carswell has described a large deposit of Chinese ceramics, thought to be a ship's cargo, in a sand-dune at Allaipiddy near Jaffna in northern Sri Lanka. (10) Many of the ceramics were made in Guangdong in southern China and dated to about 1100 AD. Sherds from ewers found at Tioman, at Allaipiddy and further west at Sharma, a port on the Hadhramaout coast of Yemen(11), are all of the same type as an 11th century ewer in the University of Malaya Art Museum (pictured left), from the Chaozhou kilnsite in Guangdong. Over four hundred fragments of large stoneware jars, used for carrying water and food, have been recovered from Nipah Bay. A large 11th century jar from Guangdong in the Sarawak Museum (pictured right) parallels finds at Tioman and in Sri Lanka. Moulded white jarlets with qingbai glaze from Qudougong, C13-14th. Celadon bowl, jarlet & dish from Longquan, C12-14th. Ceramics from Fujian, Zhejiang and Jiangsu provinces formed the next significant group, dating from the 12th to 15th centuries, when trade appears to have flourished on the eastern side of the island at Juara. Small qingbai jarlets from the Qudougong kilns, near Dehua in Fujian, were on the wreck of a local trading junk found on Breaker Shoal, south-west of Palawan in the Philippines; these are dated to the Southern Song or Yuan dynasties. (12) The jarlets are similar in design to a small jar in the treasury of St Mark's in Venice, said to have been brought from China by Marco Polo in the 13th century. (13) Sherds of coarse grey stoneware bottle-shaped jars were found at Nipah; jars of the same design were in the cargo of the Breaker Shoal shipwreck and also on a 13th century shipwreck discovered in Quanzhou harbour(14): they were traditionally used to carry mercury or quicksilver, imported for use in refining gold and also as medicine. The chief ore of mercury is cinnabar red, used to colour lacquer. Sherds of celadon dishes, bowls and jarlets found at Nipah and Juara are of the same design as celadons found on a Chinese trading ship wrecked at Sinan in Korea and dated by the wooden tags attached to the bundles of cargo to 1323(15). Small storage jars made at Yixing in Jiangsu were used at Nipah and also found on the wreck at Sinan(16). Base of bowl with a central 'double vajra' medallion, made at Jingdezhen, found at Nipah. C15-16th. The earliest pieces of underglaze blue porcelain recorded on Tioman are the bases of three bowls dating from the late 15th to early 16th century. One (pictured left) is decorated with a 'double vajra' in the centre and hexagonal/honeycomb pattern on the outside: the other two have a simple spray of a camellia or peach/apricot within a double ring. Bowls of the same design were in the cargo of ceramics from a local trading junk wrecked on the Lena shoal, south of Mindoro island near Palawan, which probably dates from the late 15th to early 16th century(17). Sherds of blue-and-white bowls with a 'double vajra' design, or a spray of camellia/peach have been found at many sites: in the moat of the Ming palace at Nanjing; at Penny's Bay in Hong Kong; in the river at Ayudhya in Thailand; on the Maldive islands, from where the Portuguese shipped cargoes of cowry shells (cypraea moneta) to Africa(18) and the Yemen(19) - and a dish with a 'double vajra' design and Jiajing mark and period (1522-66) is in the Topkapi Saray Museum at Istanbul(20). In 1554 the Portuguese carrack the São Bento was wrecked off the eastern coast of South Africa. Artefacts including cannon, jewellery, coins and mid-16th century underglaze blue Chinese porcelain, with bases of several bowls decorated with a floral spray or peach, have been recovered near the Msikaha river mouth and are believed to come from the wreck of the São Bento(21). 3 fragments of a large stoneware jar, with vertical 'mask' handles and moulded dragon, made probably at Quanzhou, found at Nipah. C15-16th. Fragments of large storage jars found at Nipah and probably made at Quanzhou, Fujian are of the same type as jars found on the wreck of the Spanish galleon San Diego, which sank in 1600 off Fortune Island, not far from Manila in the Philippines(22). The jars on the San Diego contained preserved food, grain and fresh water, and were made in China, Thailand, Vietnam, and Burma(23). In the Gulf of Thailand there are several shipwrecks of local trading vessels (often located by the slabs of granite used as ballast and found on the seabed)(24). Most of the ceramic cargoes came from Thailand. On the Koh Kradad wreck, Chinese blue-and-white porcelain was found, including part of a typical late Ming dish of 'Kraak' design, with a Jiajing mark (1522-66) but of the mid-17th century. Sawankhalok celadons from the unidentified Bay of Thailand wreck, C15-17th (Christies, 1989). A number of Vietnamese and Thai ceramics, broadly dated from the 15th to 17th centuries, were found at Juara on the eastern side of Tioman and are seen in trading sites throughout Southeast Asia. The Vietnamese saucers and jarlets are not as fine as many of the porcelains recovered from the wreck of a local trading vessel near Hoi An in central Vietnam, and dated to the late 15th or early 16th century(25), but the Sawankhalok celadons are of the same design as dishes in the cargo of an unidentified shipwreck found in the Bay of Thailand(26). Fragments of large jars made in Thailand, with large horizontal strap handles, have been found at Nipah and were washed up at the Msikaba river mouth, near where the São Bento was lost in 1554(27). These large jars were on the 1600 wreck of the San Diego, on the Kho Kradad and Koh Khram shipwrecks in the Bay of Thailand, and on a number of Dutch East India Company (VOC) shipwrecks: the Witte Leeuw ('White Lion') which sank in 1613 in St James's Bay, St Helena during a battle with a Portuguese carrack(28); the Batavia wrecked in 1629 in the Abrolhos Islands off Western Australia; and the Vergulde Draeck wrecked in 1656, also off Western Australia. Fragments of underglaze blue dishes, bowls & box, & part of an enamelled bowl, from Jingdezhen, found at Nipah & Telek, Tioman. C16-17th. More C16-17th fragments from Jingdezhen and Pinghe, found at Nipah. Sherds of small glazed storage jars found on Tioman, by tradition called 'bullet jars', match jars on the 1690 Vung Tau wreck(38). Jars of the same design were in the San Diego cargo, ninety years earlier. During the 18th century, the island was said to be the haunt of pirates; it would seem that no 18th century porcelains have been discovered apart from a fine large dish with a Kangxi (1662-1722) design, acquired in Trengganu from Tioman fishermen and now in the museum at Pekan. (39) Trading continued along the east coasts of Trengganu and Pahang. C19-20th fragments from Jingdezhen & Dehua, found at Nipah. One base has a Jiajing (1796-1820) mark; part of a bowl has a 4-character shop mark. By the 19th century trade had returned to the island and Chinese blue and white porcelain from Jingdezhen and Dehua, 'Kitchen Ch'ing', was for sale side by side with bowls and plates imported from the potteries of Europe. 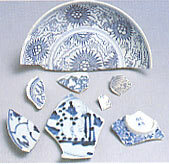 Eight fragments of 19th and 20th century Chinese blue-and-white porcelain from Nipah, pictured left, match porcelain recovered from the Diana, wrecked in 1817 on the voyage between Malacca and Penang. The ship was licensed by the English East India Company to trade between India and Canton, carrying cotton and opium to the Chinese and returning with 'Chinese articles' to Calcutta and Madras. (40) Porcelain of the same design was recovered from the wreck of the Chinese trading vessel Tek Sing, lost in 1822 in the Gaspar Straits between the islands of Bangka and Belitung, south of Singapore. (41) Both the Diana and the Tek Sing could have called at Tioman for water and provisions on the journey through the South China Sea. The ceramics found on Tioman date from the 11th century (Guangdong wares of the Northern Song dynasty), with some gaps, notably in the 18th century, through to the end of the 19th century. They illustrate more than 800 years of trade at a small island in the South China Sea. Jean Martin is secretary of the Oriental Ceramic Society, London. Jean Martin, 2001, 'The Island of Tioman and the Trade in Ceramics to Southeast Asia and Shipwrecks from the 11th-19th century', Taoci no.2 - Dec 2001, p.63-69. This issue of Taoci carries sixteen papers in French and English from a conference held in 2000 on the topic 'Céramiques du fond des mers - les nouvelles découvertes' (Shipwreck ceramics - new discoveries). Taoci no.2 is available for €23 (€28 including international postage) from Monique Crick at the Société Francaise d'Etude de la Céramique Orientale (Oriental Ceramic Society of France), Musée Cernuschi, 7 avenue Velasquez, 75008 Paris. Full membership of the society, including Taoci as well as lectures, museum tours, exhibition previews, etc, costs €60. Thanks to Jean Martin and to the Society for permission to reproduce this article on the MaritimeAsia website. Southeast Asian Ceramic Society (SEACS - West Malaysia Chapter), A Ceramic Legacy of Asia's Maritime Trade: Song dynasty Guangdong Wares and other 11th-19th century Trade Ceramics found on Tioman Island, Malaysia, Kuala Lumpur 1985. Catalogue of an exhibition with contributions from Peter Y.K. Lam, John Carswell, Tristan Russell, M.M.b.Abu Bakar, K.K.Kwan and Jean Martin. Peter Y.K. Lam, 'Northern Song Guangdong Wares', in SEACS 1985, p.1-29. Lord Medway, 'Archaeological Notes from Pulau Tioman, Pahang', Federation of Malaya Journal, Vol.VII, 1962, p.55-64. Julian Raby, 'The Porcelain Trade Routes', Chinese Ceramics in the Topkapi Saray Museum Istanbul, R.Krahl (ed. J.Ayers) 1986, Vol. I, p.55-63. P.Wheatley, The Golden Khersonese, 1961, reprinted 1980, p. 96, 229 & 244. SEACS 1985, p.56 & 57. G.R.Tibbetts, 'The Malay Peninsula as known to Arab Geographers', Malayan Journal of Tropical Geography, ix, 1956, p.39. J-P. Desroches, Le San Diego: Un trésor sous la mer, 1994, p.35. John Carswell, 'China and Islam: a Survey of the coast of India and Ceylon', the third George de Menasce Memorial Lecture, Transactions of the Oriental Ceramic Society, vol.42, 1977-78, p.24-68; and in SEACS 1985. M-F. Dupoizat , 'The Ceramic Cargo of a Song Dynasty Junk found in the Philippines and its significance in the China-Southeast Asia Trade', South East Asia & China, Intereaction & Commerce; Colloquies on Art & Archaeology in Asia no.17 1994, p.205-224 & figs 25, 33 & 35. O.C.Raphael, 'Chinese porcelain jar in the Treasury of San Marco, Venice', Transactions of the Oriental Ceramic Society, vol.10, 1931-32, p.13-15. Wen Wu 1975, no.10 - a complete jar was found. National Museum of Korea, Cultural Relics found off Sinan Coast, Korea, 1977, p.28, 31 & 99. In the 'Lena' exhibition at the Percival David Foundation of Chinese Art, 2000, but not illustrated in the catalogue: F.Goddio, S.Pierson & M.Crick, Sunken Treasure: Fifteenth Century Chinese Ceramics from the Lena Cargo, 2000. John Carswell, 'China and Islam in the Maldive Islands', Transactions of the Oriental Ceramic Society, vol.41, 1975-77, pl. 62, c & d.
A.Rougelle, 2000 (see note 11), fig. 5. R.Krahl, with N.Erbahar, ed. J.Ayers, Chinese Ceramics in the Topkapi Saray Museum Istanbul, 1986, Vol. II, p.675. C.Auret & T.Maggs, 'The Great Ship São Bento: remains from a mid-sixteenth century Portuguese wreck on the Pondoland coast', Annals of the Natal Museum vol.25 (1) 1982, p.1-220. J-P.Desroches, Le San Diego: Un trésor sous la mer, 1994. M-F.Dupoizat , 'Les jarres asiatiques en grès', Le San Diego: Un trésor sous la mer, 1994, p.222-250. P.C.Howitz, Relics from the Sea, Evidence from the Koh Kradad shipwreck excavated in 1979, Bangkok, 1979; & J.N.Green, 'Further light on the Ko Khram wrecksite', Southeast Asian Ceramic Society, Transactions no.8, 1981. Butterfields, Treasures from the Hoi An Hoard: Important Vietnamese Ceramics from a late 15th / early 16th century Cargo, San Francisco, 2000. Christie's, The Ceramic Cargo of a Medieval South Asian Trading Vessel, 1989. Auret & Maggs, 1982 (see note 21), figs 35 & 36. Rijksmuseum, The Ceramic load of the WITTE LEEUW (1613), ed. C.van der Pyl-Ketel, 1982. John Nieuhoff, The Embassy from the East India Company of the United Provinces to the Grand Tartar Cham Emperour of China, translated from Latin by John Ogilby in 1699, facsimile reprinted 1975, p.29. Engelbertus Kaempfer, Voyage to Japan 1, written in High Dutch and translated into English by J.G.Scheuchzer in 1727, p.5. C.Shangraw & E.P.Von der Porten, The Drake and Cermeno Expeditions' Chinese porcelains at Drake's Bay, California 1579 and 1595, 1981, p.32, 33, 43 & 58. F.Goddio, Discovery and Archaeological Excavation of a 16th century Trading Vessel in the Philippines, 1988, F1, p.14 and Pl.311, including base of a bowl with Wanli (1573-1619) mark. L.V.Esterhuizen, Chinese porcelain sherds on the South African coast, 1999, p.3 & 9. L.V.Esterhuizen, 'Chinese Ming blue and white porcelain recovered from 16th and 17th century Portuguese shipwrecks on the South African coast', Taoci no.1, oct 2000, p.9 & 10. P.Earle, The Wreck of the Almiranta, 1979, and Readers' Digest, Treasures of the Silver Sands, May 1980, p.203. C.Sheaf & R.Kilburn, The Hatcher Porcelain Cargoes, 1988. Re location, Michael Hatcher, personal communication, Sept 2000. Christie's, The Vung Tau Cargo: Chinese Export Porcelain, 1992. Jane Klose, 'Excavated Oriental Ceramics from the Cape of Good Hope: 1630-1830', Transactions of the Oriental Ceramic Society, vol.57, 1992-3, figs 11 & 12. Christie's 1992 (see note 36), Pl. 940-956. SEACS 1985 (see note 3), p.394. Christie's, The 'Diana' Cargo: Chinese Export Porcelain and Marine Artefacts, introduction Dorian Ball, 1995, p.620-622, 1042, 1199-1297. Nagel, Tek Sing Treasures, 2000, introduction p.12-23 and TS 45-48 and TS 69-71. The Geldermalsen was lost on the reefs of the Lingga archipelago, south of Singapore: see C.J.A.Jorg, The Geldermalsen: History of Porcelain, 1986, and C.Sheaf & R.Kilburn, The Hatcher Porcelain Cargoes, 1988, Pl.207. Nagel, Tek Sing Treasures, 2000, TS 147 and TS 1-17. William Jansz, sailing instructions, translated by Menno Leenstra.